I'm going to take this Natures Script review pretty seriously because of how important CBD is. Reviewing a mod or starter pen is different, because it's all about style and preference. But CBD is something more. It's not just about something like a loose battery door or short battery life. It's a lot more nuanced and serious. I use CBD personally to bring me back to life when my body decides to raise hell. You may use it for something similar. I give one of my dogs CBD to quell her anxiety (especially on the 4th of July), it it works like a charm. Many of the people who use CBD are using it to improve their quality of life, and you may be too. With that in mind, let's jump into it. Chances are, you might already know the answer to this question so I'll keep it short. CBD is short for cannabidiol, which is the second most prevalent cannabinoid in the cannabis plant. Cannabinoids are compounds that are unique to the cannabis plant. The most well-known cannabinoid is THC. Unlike THC, CBD is not psychoactive, meaning it won't get you “high.” But just because you won't feel high doesn't mean it isn't effective. Studies have shown CBD to be very effective for a wide variety of ailments ranging from chronic pain to epilepsy, and everything in between. 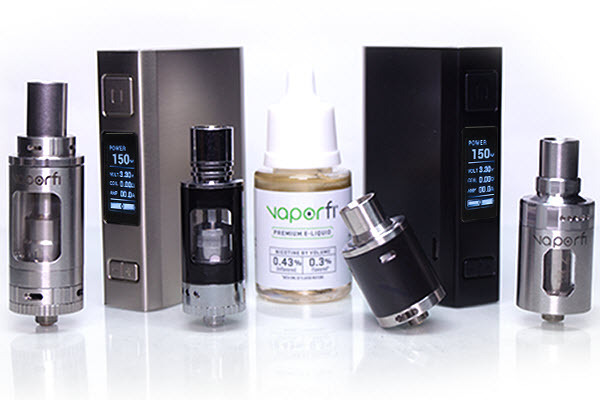 I will try to sum this up as quick as possible so we can get on to my experience with Nature's Script CBD vape juice. In short, your body has an endocannabinoid system (ECS) that has cannabinoid receptors (CB1 & CB2) from head to toe. The receptors, when activated, can modulate your appetite, mood, pain, etc (1). There are two different ways your ECS can be activated. The first way is through the endocannabinoids that your body naturally creates. The second way to to ingest cannabinoids via hemp or marijuana. I don't know of any way to get your body to produce more endocannabinoids, so ingesting some form of cannabis is the main way people activate their ECS receptors. Keep in mind, the deeply personal nature of CBD means it can effect each of our bodies differently, but horrible companies do exists. The FDA has even called some of them out. 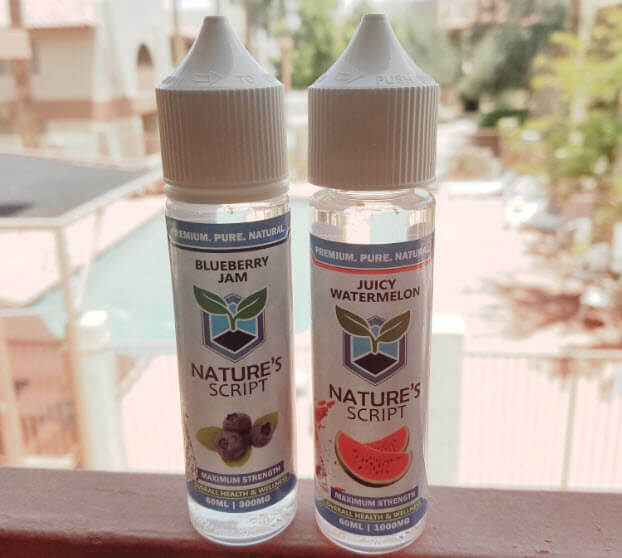 When I got my first couple bottles of Nature's Script vape juice, I had mixed feelings. I liked the shape and feel of the bottles, but wasn't in love with the design. I'm a stickler when it comes to any CBD product, so this may seem petty but it's how I felt. I got the 300 mg blueberry e-liquid and the 1,000 mg watermelon e-liquid. Both bottles say, “maximum strength” just above the size and CBD amount section. This initially confused me. I thought the order got messed up and I received two max strength bottles. Then upon further inspection I realized that it was just part of the bottle design. Other than that I am pleased with the bottles. They have a needle nose which is mandatory to get my blessing. Most of my vape pens and mods require a needle nose bottle to fill the tank without spilling. Even if you don't have a vaporizer that needs a unicorn bottle now, chances are you will get one at some point. The design of the bottles is cool. It looks like something from the future. It reminds me of Tron™. Side note, I hate bottles that use the little eye dropper style lid. They make huge messes because the outside of the dropper always drips juice everywhere. I'm glad they used unicorn bottles instead of dropper bottles. The two flavors I have are watermelon and blueberry. But of course, they have fancy names because that's the industry standard. The watermelon is the max strength offered, 1,000 mg. The blueberry is 300 mg, which is the middle tier. 75 mg is the lowest strength offered. I'm a fruit flavor kind of guy, so keep that in mind. With fruit flavors, there are several different tonalities they can take on. Mainly being crisp and refreshing, ripe, or overly sweet. I like both ripe and refreshing fruit e-liquids. I'm not big on dessert or super sweet flavors, so I can't really evaluate those types of flavors fairly. When I took my first hit of this flavor, I was instantly impressed. I wasn't sure if it would be a daily-vape kind of flavor for me, but I knew it would make my CBD rotation. It takes a couple days to get a feel for a flavor and it's longevity. After vaping on it for over a week, it's definitely my favorite of the two, which is no surprise. It's a crisp and refreshing flavor. The name, Juicy Watermelon, fits it perfectly. It's like the vape equivalent of biting into a perfectly sweet and juicy watermelon. By vape equivalent, I mean it's not as sweet as a real watermelon, which is a good thing. E-liquids are better when the sweetness is toned down, in my opinion. I really enjoyed this flavor. Sweet undertones with a crisp and refreshing feel. Definitely a daily vape for me. I was a little surprised by the Blueberry Jam. I was expecting it to taste more like an overly sweet mushy blueberry preserve. Basically, I was thinking it was going to taste more like a dessert than a pure fruit flavor. This is arguably the most important part of this review. The only other category that can be considered equally important is the lab results or cleanliness. So here goes nothing! When I first started vaping on the max strength Juicy Watermelon e-liquid, I was dealing with a mild case of the usual back pain. It wasn't especially bad or super debilitating that day. No sharp pains were shooting through my back and neck on this particular day. It was more like a medium intensity dull pain, like the pain you get when cold weather aggravates an old injury. I was talking to my wife and we were passing a cheap starter pen back and forth (iJust S), both vaping the watermelon e-liquid. Out of nowhere she blurts out, “Ooooh I like this stuff” in a chill but excited tone. Almost like she had an epiphany or something. I told her I didn't feel it yet, because I didn't. I was a little worried that this particular company's CBD wouldn't be effective for me. It happens. Not every company's product will resonate with your body, and that's what I thought was the case here. Then it slowly washed over me like a soothing waterfall in a peaceful Bali forest. I said to my wife, “Oh wait, Lex, I think I feel it now. I just got super chill and forgot about my back.” And that's pretty much how it felt for me. My pain slowly dissipated so I didn't even notice it was gone. The main thing I noticed was how calm and relaxed I was. It was like I had taken the proverbial “chill pill” or something. Quite nice! Long story short, my wife fell in love with this stuff. And you know what they say, happy wife happy life. So yeah, I'm now a lifetime customer lol. I mean, I like this CBD vape juice for sure, no doubt about it. But my wife LOVES it. She's like a raving super fan and swears by it. My wife is no rookie either because I get tons of products to test. She's tried everything from CBD gummies and chocolates, to CBD infused tea and highly concentrated vape cartridges. And no BS, this is her favorite to date. The next most important thing to consider you buy CBD is the lab tests. I think how the CBD make you feels is more important than a piece of paper, because numbers are just that. I've had more positive responses to CBD products that didn't have as much cannabidiol as some other products, according to the test. Your body may take to some brands better than the other, but this little piece of paper is still very important. What you're looking for is contaminants, or rather the lack of, and the CBD content. As far as the CBD content goes, you just want to make sure there's enough that it crosses the threshold of the minimum effective dose. Whether it's 40% or 10% CBD isn't all that important. The strength of a product is relative to the price. So if you're paying four times as much for a product that's two times stronger than its competitor, you're getting ripped off. Unfortunately, the lab results page for Nature's Script says the lab results are “coming soon.” So hopefully that does happen sooner than later so you can buy their CBD products with peace of mind. Without lab tests, you'll just have to take their word for it when it comes to the cleanliness and cannabidiol content in their products. And to be honest, that's a hard thing to do these days with all the unethical companies out there. If I find a Nature's Script coupon code, it'll be listed here. I'll check weekly (**puts reminder in calendar**). There are two kinds of CBD products I receive; the ones that go in the trash (literally) and the ones that make it onto my blog (less than 5 companies). I get so many product review requests it's not even funny. Nature's Script is definitely one of the companies that I will happily recommend. CBD is not a laughing matter and I take it very seriously. It's altered the trajectory of my life for the better and helps ease my wife's anxiety. We both found Nature's Script to be up there with the best of the best for our respective ailments. If you're interested in trying some of Nature's Script products, I recommend you buy them directly from their website, NaturesScript.com, for safety's sake. Good luck to you on your CBD search. May you get the relief you deserve!